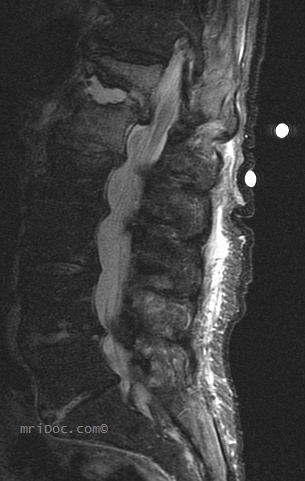 Sagittal STIR image and axial T1 image demonstrate fluid in the T12-L1 disk space and associated bone marrow edema in the adjacent vertebral bodies. There is diffuse paraspinal soft tissue edema. T12 vertebral body is collapsed. In less severe cases, it may be difficult to differentiate degenerative Modic type changes in the endplates from osteomyelitis. However, presence of fluid in the disk space points to an infectious process. 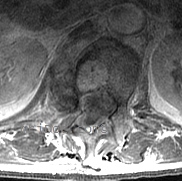 Disk aspiration is occasionally requested to confirm the diagnosis and to isolate the causative organism. Post traumatic etiology can usually be differentiated based on clinical presentation.